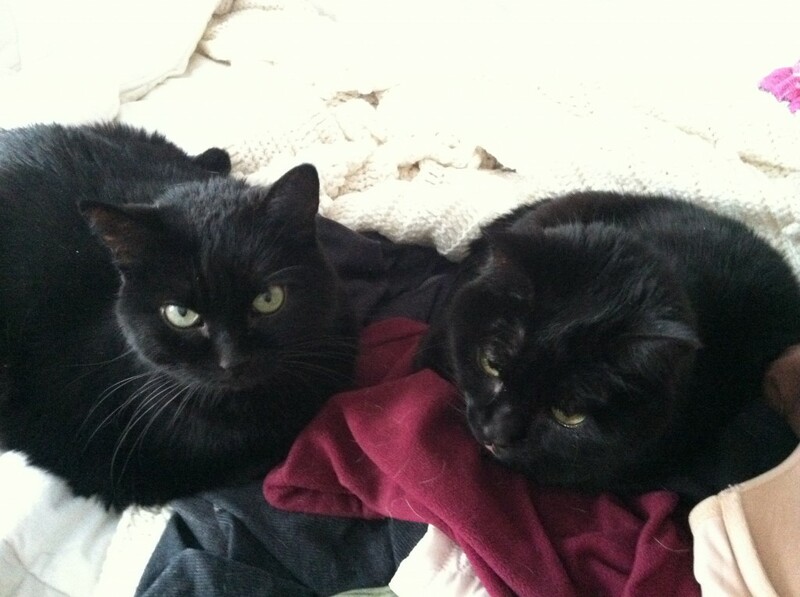 Almost 13 years ago I adopted my two precious kitties, Mabel and Juniper. Although I visited a handful of animal shelters in search of an orange kitty, the moment I set my eyes on Mabel (original name Linda—weird name for a cat name, right?) I knew she was the one I wanted to adopt. And she wasn’t orange, but entirely black! I knew I wanted to adopt two cats as I lived alone and wanted them to be able to keep each other company while I was away at work. My co-worker told me that if I adopted two that I would never have to turn on the television again as watching them play would be better than anything on TV. I agreed. As Mabel was the last kitten left from her litter, I had to try to find the perfect little playmate for her among the many other kittens waiting to be adopted. I held, petted and played with lots of cute kittens. What fun! But no such luck in finding her a pal. 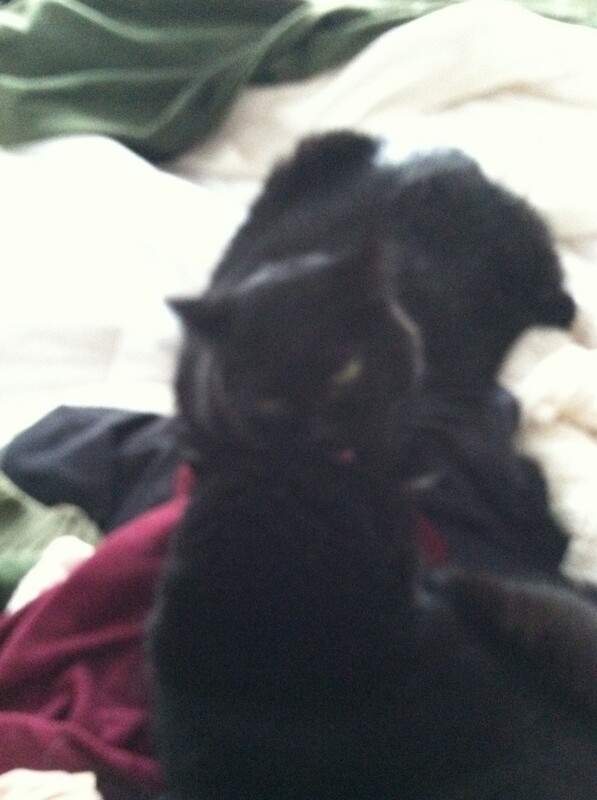 Every other kitty was too hyper or restless and just not the right one. I finally settled on only adopting Mabel that day and planned on checking back in a few weeks. Per the request of the shelter, I drove back to my apartment to bring in a copy of my lease stating I could have a cat before they would let me adopt her. When I returned with my lease ready to adopt Mabel, they showed me a kitty I hadn’t seen before. Juniper (original name Brooke). She was also an all black kitty and the last of her litter. They said, “How about this one? She has already been spayed and declawed by the University of Minnesota vet students and is only $15 more than Mabel.” I requested that we put them in a room together to see if they’d get along. They did. 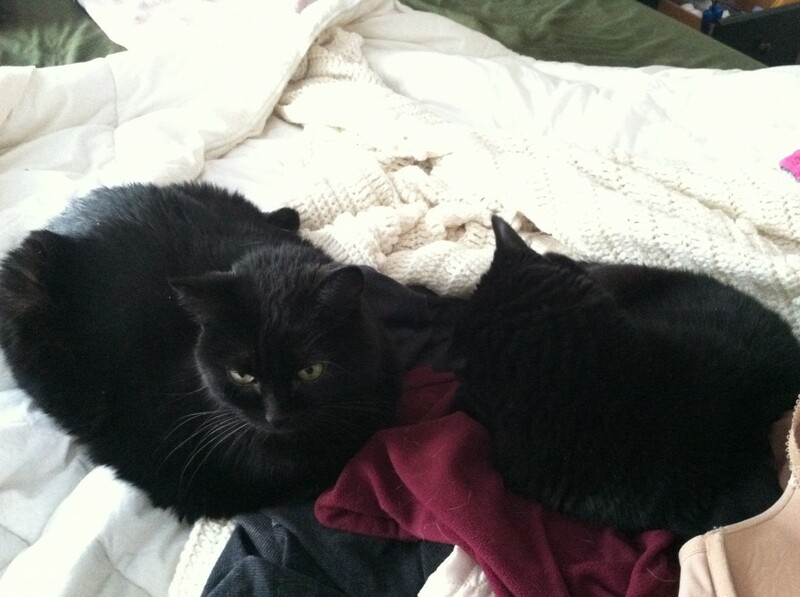 That is when I learned that all kittens get along—it’s when they become cats that they may be intolerant of each other. As a single young D in her early 20’s (what this really means is BROKE!) I decided to adopt Juniper as she was fairly calm and a really good deal. They have been wonderful pets and I could not love them any more than I do. Over the years, most of the time they just do their own thing and do not pay too much attention to each other. They will often both lie on the bed at the same time but other than that they are not very snuggly or affectionate with one another. Only a handful of times over the last 13 years have I seen them do what I have photographed below. I was so happy I had my iPhone right there allowing me to capture these tender moments between my sweet girls. Mabel on the left and Juniper on the right. These pics were taken the day before Valentine’s Day on my diabetes anniversary. Love was in the air I guess! One more cute pic taken the same day. Mabel adores her brother Jonah (and he adores her), yet it is very rare she will visit us in the living room. To come: I hope to find a few pictures of Mabel and Juniper when they were kittens for a future Almost Wordless Wednesday post. 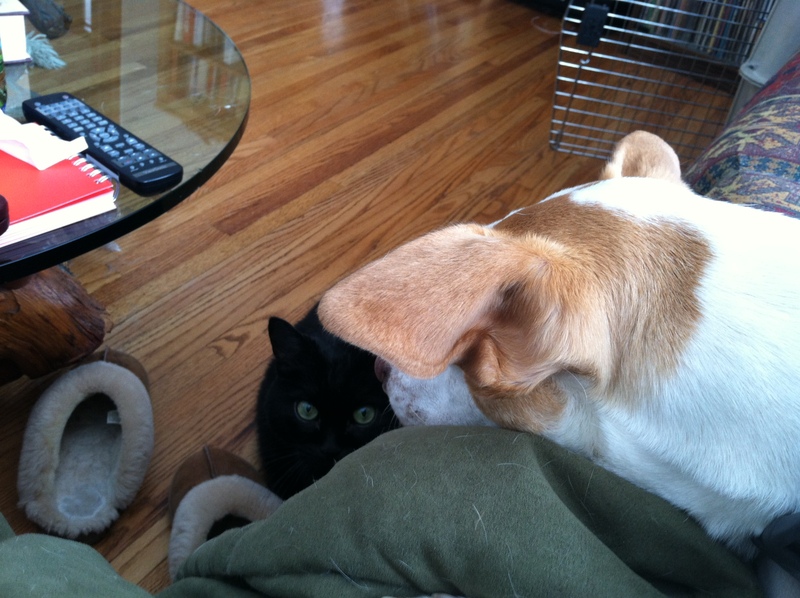 You may ask why I share pictures of my pets on a diabetes blog? Because I aim for Diabetes Light to focus on the health of our body, mind and spirit. These pictures warm my spirit and heart. It is my hope they will do the same for you. Do you have a pet at home? What is your adoption story? If you have more than one, are they very affectionate with each other? I welcome you to join our positive community at Diabetes Light on Facebook where I share stories, pictures and fun each day for a healthy body, mind and spirit! You can also find us on Twitter @diabeteslight. I look forward to seeing you there! A Poem for Tuesday: You’ve got this! Almost Wordless Wednesday: Little diabetes advocate me! Thanks so much for these wonderful pictures of your Furperson feline and canine angels. These warm my heart and soul!!! I long for the day when we move to a home where I can again know the joy and love of a Furperson angel. Thanks always for sharing yours.